5. 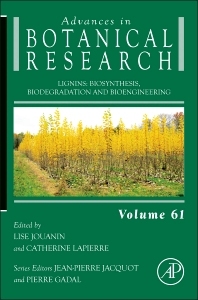 What Role for Plant Laccases in Lignin Polymerization? Lignins are nature’s aromatic polymers and are the second most abundant organic constituent of the biosphere next to cellulose. Lignification mainly occurs in the walls of terrestrial vascular plants, mainly in the secondarily thickened cells of supportive or conductive tissues, which thus acquire novel properties. This new volume of Advances in Botanical Research gives a special emphasis to the bioengineering of these enigmatic polymers. It is divided in nine chapters containing up-to-date reviews by expert groups in their field.